Are you looking to get away this summer and take a fun quilting class? Well look no further. I will be teaching my fusing technique in LA Grange TX July 20-22, 2018. This is a wonderful venue and an exciting class to take. We will be making my quilt Winter Forest using either colorway of my hand dyed cotton and silk fabric. What could be more fun then that? This project requires you to let go and be creative. Students will begin by picking out their color scheme from the yards of hand dyed fabric that Frieda will provide as part of the kit. There will be plenty of color choices to pick from, OR, students can make the design in the color scheme shown in the sample. Of course, Frieda will help the students with their color decisions. Raw-edge fusing makes this class fun and easy, and you’ll learn new techniques to make it fast. A kit takes the worry out of the fabric selection, and Frieda discusses machine-quilting tricks to complete this colorful wallhanging at home. Fusing allows for endless possibilities with easy construction of shapes and details that will open the doors of creativity for you. No sewing machine is required to create the quilt top. Using organic shapes and free, expressive cutting, students will create an improvisational, collage-style quilt top. 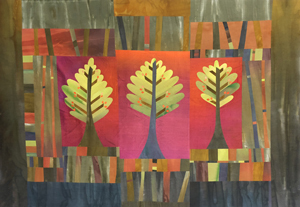 Students will learn how to use strip fusing sets and traced design elements to assemble this one-of-a-kind wallhanging. Class size is limited to 25 students, so there is plenty of opportunity for interaction and hands-on experience at individual workstations. The weekend also includes a trip to the Texas Quilt Museum. All meals are included and there is some accommodation available in the Center’s charming dorm rooms. and design at the beautiful Great Expectations Creativity Center in Central Texas. This event is going to be amazing!